The graphic novel version of MetaMorphosis is now available in print and ebook! When a young war veteran who wakes up one morning transformed into a zombie, his mousy teenage sister discovers a very appealing way of keeping him fed. With deadpan humor and an expressive, minimalist style, MetaMorphosis is a horror adaptation of Kafka’s story of the same name, updating the classic tale for savvy, contemporary audiences. A BIG THANKS to everyone who’s been supporting the book since it first started as a webcomic and then later on comiXology! 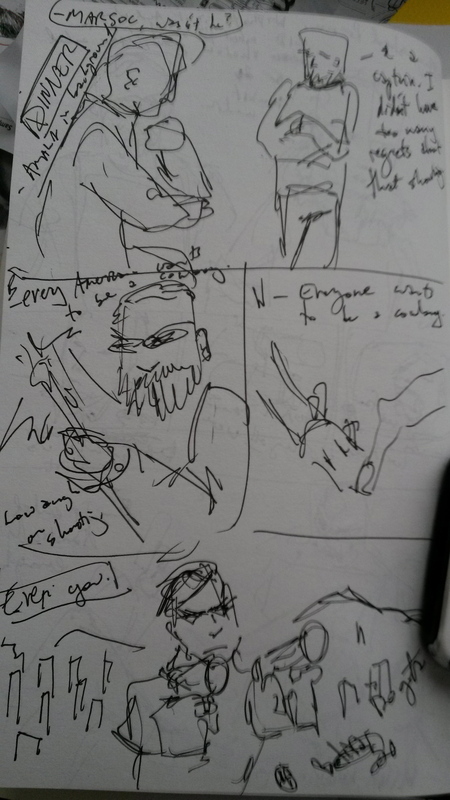 The going’s been rough with the graphic novel, but I’m close to being on schedule. 20 days in and I’m 42 pages into the projected 90 pages. With me getting sick and then the babysitter getting sick, life keeps getting in the way of work. Then there’s pre-production on next month’s shoot, so all-in-all, I can’t complain about my progress. At the start of Day 14 of this project, I’m 29 pages in. Not great, but by the end of the day, I ought to be on par-ish. Labor Day weekend was a great sucking vacuum that devoured all productivity, and I spent last Wednesday, it being new-comic-book-day, doing “research,” a pleasurable chore that I will have to pass on this week. I thought I’d drop a couple notes on the drawing process I’m using for this project. Again, I’m not taking every page to completion. The goal here is to get the line art, what I consider the heavy-lifting, done. Heavy blacks and my usual ink wash will come at a later date, when I’m back from a shoot in Brazil. (Let’s hope this trip doesn’t leave me with another rash covering my body). 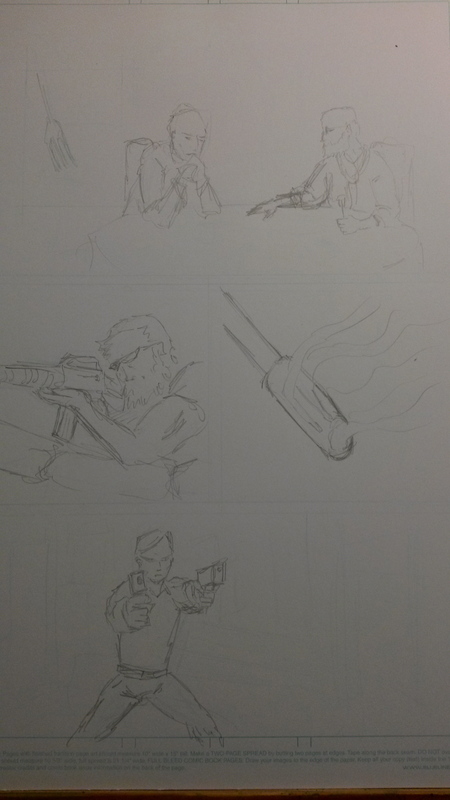 After I do a really rough blue pencil layout, I draw some of the picture in pencil. This is usually pretty rough as well, and mostly just on areas of the page I’m afraid of screwing up. Much can change from the thumbnails to here. I like using an F pencil. It’s pretty light, and, since I do most of the work in the real world (not Photoshop) I need to be able to erase it. I’ll add more details and embellishments later with an art nib. The foliage in the top panels, the cityscape in the bottom panel, and all the grays will be done with brushes later. 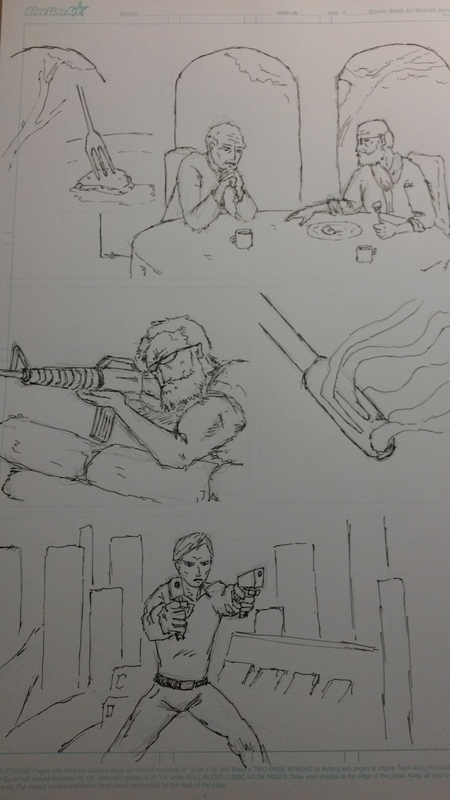 I’m not John Cassaday, but I can draw well enough to spin a yarn. I wouldn’t use this style of illustration for every work I do, but this content leans towards the surreal (as demonstrated by the nonlinear panels above) and impressionistic images fit the tone. For more ruminations on how create a quick graphic novel, I suggest Double Barrel from Top Shelf. Digital copies of the books include various “how-tos” in the back. If memory serves me, the back of Amazing Spider-Man Annual #1 also includes a basic how-to on creating comics the Stan Lee and Steve Ditko way. You are currently viewing the archives for September, 2014 at Princess Revolver Media, LLC.